Today I’d like to discuss some of the implications of what DSTG scientist Neil Gordon said in the course of the interview I published yesterday. In particular, I’d like to look at what he told me about the ATSB’s interpretation of the 0:19:37 BFO value. Essentially, Gordon assures us that the experts have looked at what the manufacturers know about how these boxes work, and the only interpretation they can come up with is that the BFO value was the result of a very steep rate of descent–specifically, 5,000 fpm at 00:19:29 and then 12,000 to 20,000 fpm at 00:19:37. This is got a gentle deterioration; it’s accelerating at about 1/2 g, so that in another 8 seconds, at that rate, the descent will be at 19,000 to 35,000 fpm, that is to say going straight down at 187 to 345 knots. Remember that the plane had already been losing speed and altitude for five to fifteen minutes before the second engine even flamed out, and losing more altitude in the subsequent two minutes before the 00:19:29 ping was logged. Thus, both velocity and acceleration point to a situation in which the plane will be hitting the surface in short order. Bearing in mind that the plane would be in a spiral dive if unpiloted, I can’t see how it could have traveled more than 5 nm from the last ping, let alone 15nm, let alone 40 nm. It would have hit soon, and it would have hit hard. One possible explanation would be the idea that the plane was in a phugoid: plunging quickly, then rising again, then plunging again. But as I wrote in a previous post, simulator runs by Mike Exner suggest that these extreme rates of descent are characteristic of the later stages of an unpiloted post-flameout plunge, when phugoid effects are overwhelmed. Thus, if the ATSB is correct in interpreting the final BFO value as a very steep plunge–as Gordon assures us they must–then the plane should be well within 15 nautical miles of the seventh arc. The chart above (based on the invaluable work of Richard Cole) shows a band of seabed, marked in red, defined by an outer border that is 15 nm beyond the 7th arc and an inner border that is 15 within the 7th arc. As you can see, this band has almost entirely been searched out to the 99% confidence level as defined in Figure 2 of my previous post (located at the intersection of the 7th arc and 94.85 degrees east). All that remains is a rectangle approximately 17 km wide and 150 km long, for a total area of 2,550 sq km. According to Figure 3 in that same post, the DST calculates that the probability that the plane crossed the seventh arc northeastward of 96.75 degrees east longitude is effectively zero. To search to this longitude would require covering another 3,700 or so sq km. Thus, to cover all the seabed that MH370 could plausibly have reached, if the ATSB’s BTO and BFO analysis is correct, would require another 6,250 sq km of seabed scanning, which is more or less what the ATSB has been planning to search anyway. Unfortunately, the search at present is not taking place in either of these remaining areas. Both the BFO and the BTO analysis are correct, and the plane is lying somewhere in the remaining 6,250 sq km described above. The BTO analysis is correct, but the BFO analysis is wrong. In this case, the plane was not necessarily descending with great rapidity, and instead might have been held in a glide, and is most likely in “Area 1” shown above. Both BTO and BFO analysis are incorrect. The plane could be just about anywhere. I happen to believe that the DSTG knows what it is doing, and that 2 through 4 are not the case. On the other hand, the unsearched areas remaining are at the far fringes of likelihood, and so don’t feel that #1 is a high-probability option, either. 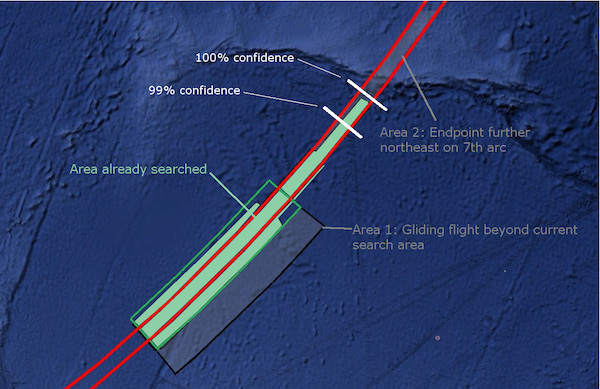 No doubt some will argue that the plane might have been overlooked within the area already searched, despite assurances from officials that if it was there they would have seen it. Frankly, we’re running out of compelling options. It is NOT a sat-phone call at 18:40!! It is a “Call Progress Analysis” tool run by network techs to trouble-shoot connectivity problems. The ground-to-air ACARS message at 18:03 was not acknowledged and the retransmission attempt 90 seconds later failed so the next step is for the operator or a comm tech to check connectivity to the aircraft. The Inmarsat network is based on the old ISDN telephone network as reflected in it’s use of the terms : “Call Setup”, “Call Progress”, “Call Release”, “Call Status”…Look at appendix 1 and 2 of the Inmarsat logs. As I remember well the Malaysian military did not regard the plane as a threat and therefore did not scramble jets. And while it was heading for Penang I can imagine they thought so for it looked like an emergency approach to that airport maybe. But after it became clear MH370 was not going to land on Penang it must have set off an alert. They tracked it all the way over Malaysia so they saw this too and must have been prepared for it. Alerting Butterworth and the jets stationed there. Time enough. Those jets must have been ready for action. Maybe they let it slip and informed Indonesian and Indian military to keep a close eye on the plane and react if necessary. For it did not cross an Indonesian FIR-boudery or airspace Indonesia was not in a position to react on it. But if flown into the Andaman islands MH370 had to pass the Chennai-FIR boundery and had to identify itself to ATC there. If MH370 would not respond the plane would immediately become suspect and alerted to Car Nicobar military base and air-force. Car Nicobar is not a small insignificant Indian military outpost but a well equipped Indian Navy and Airforce base. They have a sophisticated 24/7 200miles radius radar and all the means to shoot every plane down that comes into their airspace. Port Blair is more up north in the Andamans but it also is a sophisticated military base with a wide range radar system that could have detected MH370. To believe all this radar systems were shut down at that time is nonsens or wishfull thinking IMO. If the SatCom antenna loses view of the satellite for more than 11 seconds the SDU will drop the call, try to locate a satellite and re-logon. No power interruption is required to trigger a logon request. Thanks. But sat-phone call or connection-check in my story it would have served the same goal; check if the plane was still in the air or crashed. It has been reported in Indian newspapers that the radar unit there had been switched off at the time (as no one in India expects an airborne invasion from Indonesia). While the runway is 8900 feet long and regularly handles Il-76s, Boeing 737s and Airbus 320s, generally it does not have combat aircraft. Only helicopters and Dornier 228 light transports are stationed there. There might be some sort of anti-aircraft defense as well, but essentially there is nothing capable of chasing something like MH 370. The other nearby base at Campbell Bay, as well as the larger one at Port Blair a few hundred miles north also have similar aircraft stationed there but not fighter aircraft. However, if anything approached the Indian mainland something would certainly have happened to it. Also, india had temporarily given up their outpost and the wsj article indicates that the radar wasn’t manned, something you could have expected in advance. 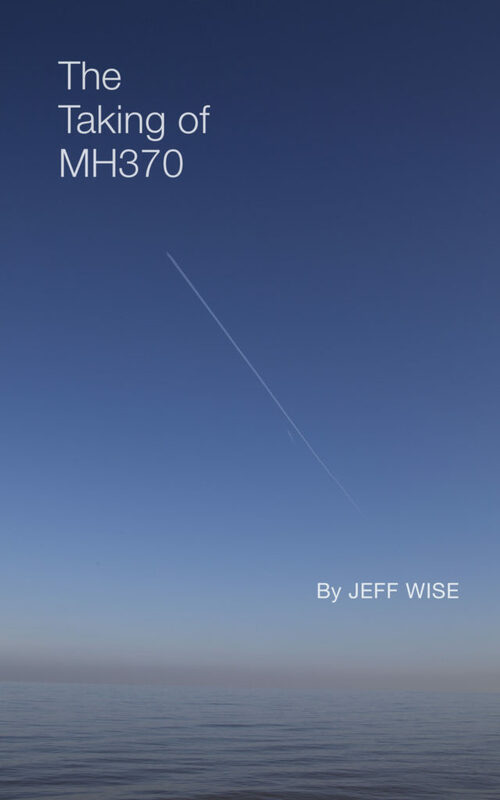 The goal was not to see if the plane was “still in the air”…though it did prove that. The goal was to respond to a comm failure. An Inmarsat operator would have received an alert on their communications network console when the ACARS re-transmission failed and intitated a CPA test as standard procedure. Could the 23:14 call also be a Call Progress Analysis test? If so, why then? @ABN397 Thank you I enjoyed reading the links to A. Rangamanathan’s articles in The Hindu. Rangamanathan seems to suggest the digital flight data recorder can be turned off. So I am wondering if locating MH370 will actually answer any of the technical/motive questions. Seems both MI185 and MS804 we have no flight data recorded for the end of flight descent. Finding MH370 is of course important for the families and airline industry. If it was a Call Progress Analysis test at 18:40, that means it was not Malaysia Airlines trying to contact their aircraft, right? If true, I wonder why not? If it was a CPA test, would the phone ring on the flight deck? Even if it did, can you tell if anyone picked up the receiver to answer it? If I had to guess their radar might have caught part of MH370 flight(likely part of the flight through Malacca Strait) and they possibly provided it to investigators however they couldn’t conclude anything from it. Is it feasible to request DSTG for the list of considered roll modes? Can Dr. Gordon help to clarify this? I would suggest the 2 peaks in Fig.3 correspond to the two modes: HDG & TRK HOLD. I would expect the peak of magnetic HDG/TRK (if these modes exist), to be around 32S, and the ATT mode – around 25-30S. Fig.3 shows probability close to zero in these areas, implying to me that neither magnetic nor ATT mode were included into the study. I fear that DSTG were simply requested to consider only the two most likely AP modes. Hi Jeff – forgive me but why can’t the 4 of your possibilities in the main post here be confirmed by real-world testing/re-enactment? It seems to me that this whole BTO/BFO analysis method-thing will need confirmation testing anyway in the event another plane disappears from the face of the earth forever. Or maybe that is already being done and I didn’t read it. RetiredF4 – In the fall of 1957 (plus or minus a couple of years), my uncle, aunt, sister and I were weekend guests in the home of F4 Ace, Gen. (then Col.) Robin Olds. Know him? If so, that would put us two degrees of separation apart. He gave us a driving tour of Washington DC. Jack Benny was a guest one evening (probably his 39th birthday) but I was too scared to meet Mt. Benny. I was about 8 years old at the time. The SDU was denergized at 18:03 when a ground-initiated ACARS contact request was sent to the aircraft, ie there was no handshake from the SDU. Sorry Tom, that won’t wash. The SDU was probably deliberately switched off at the time of the takeover, and not switched on again until 18:24. It is the same test a telephone central office uses to check a land-line for on/off hook, so no ringing on the flight deck. On a cell network they can ping a cellphone phone and see if it is powered on. The delay after the 18:03 ground-to-air ACARS timeout suggests a GES station operator initiated the 18:40 CPA test. A call that would ring on the flight deck would be a “Call Progress – Connect” which will be responded with a “Call Attempt – Result” showing that it had been “busy” or “picked-up”. IMO definitely…a burst of 12 call setups with as little as 20 ms between some of them just like the 18:40 which appears to have been run twice. Did you ever get a response on your question if it was SOP to start the APU after an engine flame-out? Robin Olds?! Wow! Jack Benny?! Double Wow! I was lucky enough to see the 3 Apollo 11 astronauts leave the London Hilton, en route to Buckingham Palace, during their World tour in 1969. Armstrong was gracious enough to give us a nod as he got in the limo. Then I bumped into the 3 Apollo 17 astronauts at the Paris Air Show, in 1973, while they were taking a photo call seated on a mock-up of the lunar. I was too bashful to ask for their autographs. Life is full of missed opportunities. Perhaps you haven’t read Factual Information 1.9.5.4. Both calls were made from a telephone with country code 60 (Malaysia). Both calls were unanswered and were cleared by the calling party. I believe it was stated elsewhere that both call were made from MAS OCC. Anyway Inmarsat would know the caller’s number if only for billing purposes. Or it was energized and it’s antenna could not see the satellite at any time during the transmission so there was no handshake (message ack) from the SDU. It only needs to miss a single SSU to cause a 90s timeout and re-transmission from the ground. Link outages of several seconds are common during flight esp. during turns. As a result of AF447 Inmarsat is on the path to stream FDR data real-time by 2020. They would not propose this if the SDU did not have access to multiple power sources like the ADIRU, FDR and CVR. The SDU is mounted on rails in the tail just inches away from the CVR and FDR so 115 AC, 28 VDC and battery power sources are definitely available to if not already used by the SDU. Both Rockwell Collins and Thales say their units will run on both 115AC and 28VDC. A 777 MM electrical diagram should show if the SDU is wired to multiple power sources. The existing schedule to launch Inmarsat-4s to replace Inmarsat-3s is why the 2020 date was arrived at. Inmarsat-4s will have the bandwidth necessary to accommodate the increased network traffic. George, you are just making it up as you go along. The SDU takes 115V AC power from the LH Main AC bus. Isolating the bus would remove power from the SDU. The SATCOM high gain phased array as carried on 9M-MRO, is capable of maintaining lock during all but the most extreme flight manoeuvres. A barrel roll would cause it to break lock, I agree. The pilot incorrectly entered longitude (01519.8E instead of 15109.8E) for ADIRS initialization – a simple human mistake. I would be interested to see BFOs for this AirAsia flight. I think you, (and many others it seems) are stuck in the mindset, that Z was “a one man band”. He most definately was not “a one man band”. I outlined the essentials of the plan on Ed Baker’s blog ages ago. Z was NOT engaged in “the negotiations” in the air, “others on the ground” were. Z was in the air, holding the aircraft as “the threat” element of the ultimatum. In simple terms, the people on the ground were dealing with the “individual(s)” in the MY gov. Z was in the air, cruising south towards Cocos, “waiting” for advice from his ground colleagues, as to whether or not the demands would be met (either by satphone call, or, much more likely, by HF radio). He obviously never got the required confirmation, or perhaps, worse, he may have actually got direct confirmation, that the MY gov had actually rejected the ultimatum (again I say, by HF). He then had to execute Plan B, and did, full well knowing the consequences. There is life after death as they say. He knew full well that the loss of the aircraft would raise hell, and he also knew that his colleagues on the gruond would be tracked down and “dealt with” by the MY gov, but not before they had passed their information on to “other parties”, as a safeguard, in the event that they were “taken down / out” by the MY gov. Who those “other parties” may be, would make for very interesting speculation. Z also knew, that every intel agency would go into overdrive on 370 as well. Now step back and look at the big picture. US gov quickly “classifies everything” they know on 370. Some little time later, US Justice Dept and other agencies crank up their 1MD investigation behind the scenes – all classified. Some months after that, Obama suddenly goes play golf with Najib – first visit of a President in decades, no apparent reason, and the public are told nothing. Some months after that, US Justice Dept goes public on 1MD. As the old saying goes – connect the dots. And I forgot to mention, Google Earth showed that there was a RAAF P-3 on Cocos (YPCC) around mid-day local on Saturday the 8th Mar 2014. It is highlt unlikely that it was there, on that day (a Saturday), and at that time, (late morning – mid-day by the shadows, so say around 0800 zulu) “purely by chance”. Had it “just flown in from the mainland” to refuel, prior to commencing a secret search in the Cocos area ? Closing comments here, please add your thoughts to the most recent post. Thank you!